Police have arrested more than 250 people in central London as climate protesters brought parts of the UK capital to a standstill for a second day running. Led by the British climate group Extinction Rebellion, large crowds gathered in areas including Oxford Street, Regent Street, Marble Arch, Waterloo Bridge and parliament square in an attempt to force the government to act on climate change. Climate change organisers said protests had been held in more than 80 cities across 33 countries. In London, motorists faced gridlocked traffic on a number of alternative routes, such as Westminster Bridge and Blackfriars Bridge. 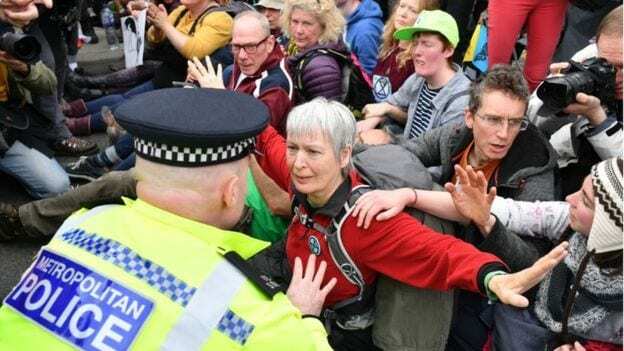 Extinction Rebellion generated headlines earlier this month when protesters stripped off in the House of Commons public gallery, putting their backsides against the glass and prompting outrage from some MPs. The group is demanding the government declare a climate and ecological emergency and reduce greenhouse gas emissions to net zero by 2025. On Monday tents littered the roads at Oxford Circus with some activists huddled beneath a pink boat with the words “Tell the Truth” across its side. One placard read: “Rebel for Life”. Police said five of those arrested had been detained after the Shell building near the River Thames was targeted with graffiti aimed at Shell the petroleum company. Two protesters scaled up scaffolding writing ‘Shell Knows!’ in red paint on the front of the building and three protesters glued their hands to the revolving doors at the entrance.